Ramadan is coming to Algeria, and just like every year, special meals – and soaring costs – are on everyone's mind. But before any meals can reach the table, Algerians must brave bustling markets. This year, they had the longest weekend in history for shopping: Thursday, Friday and Saturday, thanks to the transition to the new Friday-Saturday weekend last week. Prices are rocketing, despite efforts to rein in shopkeepers by the Ministry of Trade and the Algerian Traders' Union. "It's like this every year; you have to stock up before Ramadan, no matter what the price," said Said, an elderly man shopping in the Bab El Oued market. "What can you do? People buy without counting the cost, and they all come looking for the same items at the same time," said vegetable vendor Kamel, who sat behind a vegetable stall in an alley adjacent to the so-called "Three Clocks" market. The lure of profits has casual vendors busy selling everything from parsley to dioul (fine dough for pastries). So great is the opportunity that many people switch from trades like hairdressing and fixing cars to selling Ramadan zalabiya for the month. Closed sheds are opened and young people erect tents made of reeds everywhere to serve as small mahchachates (places where people can play games while enjoying snacks until morning). "Each Ramadan I club together with two neighbours to hire a shed and set up a mahchacha," said Samir, a civil servant who had just gone on annual leave. "It's a way of making a bit of money and is a time that young people in the area take advantage of. With nothing to do, the young people come round my place every evening to play dominoes, listen to chaabi music and sample my cakes and kebabs." The pocketbook pinch of Ramadan shopping is balanced with the pleasure of delicious meals. "It's the only month when women put their culinary skills on display," said Farida, who prepares her family's meals. "During the rest of the year, people eat snacks or pizzas in fast-food joints or whatever else is convenient." The fast is usually broken with an iftar of dates and ben ou rayeb (curdled milk). Algeria is home to one of the finest dates in the world, the deglet nour, and mosques raise money to buy enough dates that worshippers can break their fast before the Maghreb (twilight) prayers. In eastern and central Algeria, what follows is usually chorba frik (a soup of crushed wheat and tomato sauce), or in the west of the country, h’rira (a vegetable soup). 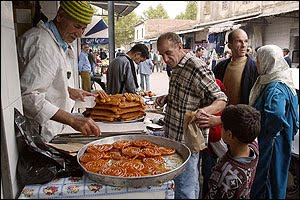 In Algiers, the next course is usually boureks, while a larger version called a brik is served in western Algeria. These leaves of dough are filled with boiled potatoes, eggs, minced meat and even prawns. Then comes the pièce de résistance, usually ham lahlou. This dish of lamb with prunes and dried apricots is only eaten on a few days during Ramadan. The last dish before the next day's fast begins is s’hour, which is usually couscous with raisins and curdled milk. Some people, however, prefer white coffee with cake or another hot dish. Many people prefer to partake in the pre-dawn hours, but not everyone rises that early. "I'm a civil servant and I can't afford to get up at four in the morning to eat," said Salim. "I might not make it in to work." Besides the pleasures of traditional dishes, Ramadan traditions are seen in the way day and night-time activities break down along gender roles. Alongside cooking meals and spending evenings enjoying boukalate (a riddle game), women are customarily visited by neighbours or relatives and savour mint tea and pastries. Men tend to meet friends at cafés or the mahchachates, where the nights are filled with tea and a range of sweets, as well as chats with friends and music. Those who perform taraouih prayers are the last to join in the nightlife. But even with all the socialising with friends and neighbours, Ramadan is a family affair. "It's the only month when the whole family sits around the iftar (fast-breaking) table," said Farida, a teacher and mother. "I eagerly wait for this month so I can see my grandmother play boukalate with her neighbours," said Razika. "It's an ancestral treasure that they keep alive."